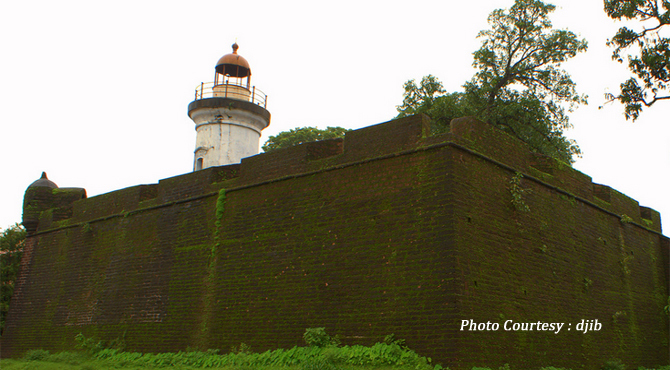 Thalasseri Fort is an imposing historical monument situated in Thalassery (Tellicherry) a town in Kannur District of Kerala. Stands on a rocky cliff, right on the Thalasseri beach, it is just 22 kms away from Kannur district. Even though some parts of it collapsed, it still in a fairly good state of preservation under the Supervision of the Archaeological Survey of India. The fort was used by Lord Wellesley against the Pazhassi Raja's rebellion. The famous Malyalam movie 'Pazhassiraja' was filmed at this historical fort. Thalassery previously known was the first settlement of the British East India Company on the western coast. The British arrived in Thalassery in 1683, and they shifted their commercial capital from Kozhikode to Thalassery, following obstruction from the Dutch. Due to their request, they got permission to build a factory to store spices and other items for trades. This became a strong resistance against Dutch. By 1695, the British traders had started their business from Thalassery. Soon they understand the ample scope of the spice trade, thus leads to the erection of the fort. By 1700, the British built the Thalassery Fort around the “factory” on a small hill called Tiruvellapadkunnu and it was reconstructed in 20th August 1708, by strengthening the gigantic walls and incorporating huge intricately carved doors. Further, it became an important political center. The fort was the military center of the British. It is believed to have a secret channel to the sea, which was used as an escape route when under attack. In 1780, Sardar Khan's Mysore army captured the fort, but in 1792, British defeated the Mysore force and imprisoned 1,200 Mysore militants, including Sardar Khan. Later, Sardar Khan committed suicide inside the fort. Thalasseri Fort, now under the supervision of the Archaeological Survey of India has a magnificent gate way and a light house. Around the fort stands the Brennen cemetery, St.Rosario church, St.John's Anglican church and the sub-collector's bungalow. Brennen cemetery, named after Sir Edward Brennen, houses tomb's of many European officials of the East India Company. The Sports Authority Of India Gymnastic Centre, established as a circus training centre; an old Muslim mosque known as Odathil Palli, the Jagannatha Temple dedicated to Siva and Thiruvangadi Sree Rama Swami temple other wise known as the Brass Pagoda are other attractions nearby.